On this page, you will learn how to print Hello World or any other message on the console using Spring 5 framework. This example will guide you step by step to develop the first program in Spring. Before staring all we need to download the Spring JAR file and configure it in Eclipse IDE. 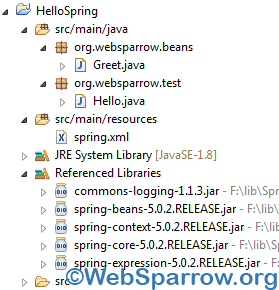 To developed core Spring application, you mainly required 5 JAR files as listed below. You can also add the below dependency under the dependencies element if you are a Maven user. Find the project structure in Eclipse IDE. Inside the beans package, create a simple class Greet that contains a method welcome(). Configure the above Greet class in spring.xml file. Configuration file name can be anything. In my case, it was placed inside source folder src/main/resources. Now the final step executes the code. To execute the code we need to read the configuration file spring.xml and call them by using bean id. When we execute the above code, it will print the following message in the console log.